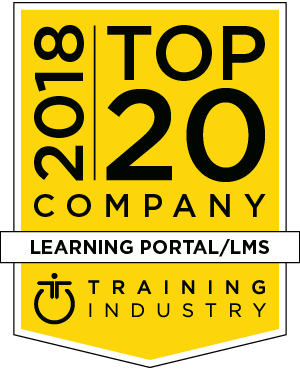 As part of its commitment to continuously monitor the training marketplace for the best providers and services, TrainingIndustry.com has released its 2018 Top 20 Learning Portal/LMS Companies List. In order to be considered for a nomination to a TrainingIndustry.com Top Companies List, participating companies must submit a comprehensive application survey and meet other Top Company List specific requirements. TrainingIndustry.com makes an effort to reach out to as many companies as possible within a given market segment. Our goal is to present you, the reader, with the most comprehensive Top Companies List in the industry. Due to the diversity of client need in the learning portal/LMS space, no attempt is made to rank the Top 20. Talent Suite is a scalable learning and compliance management solution for organizations in high-consequence industries, and for extended enterprises with complex compliance and mobile training requirements. With crucial security certifications, this is a secure, single-tenant solution that deploys on-premise or as a secure SaaS offering. Our purpose is to improve the productivity, safety and health, environmental value and profitability of organizations. We initiate workplace transformations by sharing real-world experiences and best practices. The DuPont™ eLearning Suite helps standardize, administer, track, and customize online training. Cornerstone was founded on a belief that a lifetime of learning and development is fundamental to growth — for both the employee and the organization. So, we created what is today one of the world’s leading cloud-based learning and human capital management software solutions. As one of the largest and most experienced providers of learning management systems and portal implementation and support services, GP Strategies offers a uniquely customer-centric approach that emphasizes hands-on support and extensive customer training. G-Cube Solutions has been around for 18 years and is one of the few solutions to carry a CMMi Level 3 certification. G-Cube has received more than 70 awards in the last seven years, including Brandon Hall Apex Awards, and LearnX Awards. G-Cube is a self-funded organization with around 30 percent growth year over year. Docebo’s platform facilitates learning in the flow of work and day-to-day experiences to drive growth, organizational performance and revenue. Docebo has been embraced by more than 1,400 companies around the world for its elegance and ability to deploy blended learning strategies (formal, social and experiential). Litmos is the world’s fastest growing cloud-based learning automation solution that unifies learning management, the extended enterprise, and prepackaged content to meet any organization’s internal and external training needs. Over 10 million users across 20 industries and more than 130 countries use Litmos in 24 languages to learn better. Gyrus Systems is the premier seventh generation learning management system (LMS) provider in North America. We work with training and development leaders, safety and compliance managers, and HR professionals to deliver true integrated end-to-end employee development solutions for the last 30 years in 16 different countries. Valamis has fast development cycles in product development, releasing new versions every three months, which means customers get new features and improved existing features to use quickly. Customers play a critical role in Valamis’ product development. Valamis has worked with IBM Watson to bring artificial intelligence to the learning platform. Skillsoft comprises three award-winning solutions that support learning, performance and success: Skillsoft learning content, Percipio intelligent learning experience platform and SumTotal suite for HCM, which includes SumTotal Learning Management. With Adobe Captivate Prime LMS one can deliver engaging learning experiences in a personalized manner across devices. One can align all online and offline enterprise-wide learning initiatives to skill, upskill and reskill one’s employees. CrossKnowledge solutions are based on world-class content, a social and mobile learning experience that integrates the latest advances in educational research, and 18 years of experience with best practices in the deployment sphere. Absorb LMS is the learning platform choice of some of the world's most recognizable brands, including several industry disruptors. The innovation that drives those companies is the same innovative mentality that drives Absorb. Absorb LMS gives the users the power to build the branded learning environment their business needs to achieve real goals. BizLibrary is dedicated to learning professionals focused on providing the best and most complete online training solutions. Whether you are looking to deploy off-the-shelf content, custom content, or manage classroom training and certifications, we have a solution for you as our learning technology is a dependable catalyst for achievement. Aptara is constantly providing innovative solutions to our industry. With the development of augmented and virtual reality, Aptara is combining different learning styles to increase learner engagement. Predictable analytics is another area Aptara is providing valuable services to enable our client to reach their level of learning excellence. Brainier replaced traditional learning management system barriers with doorways to make access and education easier and more effective. Growth Engineering is an award-winning learning technologies company. They focus on engaging learners with their training and apply gamification to online learning programs. Their solutions are the Academy LMS, a NextGen LMS; Genie, a game-based content authoring tool; and The Knowledge Arcade, a mobile microlearning app. At Wisetail, we pride ourselves on our relationships. We truly value each client and work tirelessly to bring our clients the very best LMS experience. We've grown over the years by listening to our clients - the innovators and experts in learning and development - to build a product that is up to their standards. As part of our commitment to continuously monitor the training marketplace for the best providers and services we announce the ninth annual Learning Portal/LMS Companies Watch List. The 2018 Learning Portal/LMS Companies Watch List is intended to help buyers of training services evaluate learning portal providers, representing emerging or unique strengths or capabilities. Due to the diversity of client need in the learning portal/LMS space, no attempt is made to rank the Watch List. eLogic Learning is a leader in learning management technology. Its eSSential LMS makes it easy to manage e-learning, training events, compliance, and continuing education and analyze training results, with new enhancements released every three to four weeks. UpsideLMS is a leading provider of learn-tech solutions to enterprises, SMBs and training providers worldwide. From a learning management system with support for online, offline, formal, informal and m-learning to a ready-to-use training content library, it leverages its 14+ years of experience and expertise to enable businesses to succeed. AllenComm's learning portal is built upon versatile architecture unique to AllenComm. We designed it to provide customers with sustainable customization. The architecture also provides a custom UI that seamlessly integrates into their website. It also allows for easy integration with other systems and adoption of new technologies or features. Using its combination of social learning and gamification, Motivate Cloud increases engagement, collaboration and retention. It gives learners the tools to succeed all on one platform and allows companies to effectively and efficiently track their knowledge and behavior. Agylia provides organizations with learner-centric technologies. With a key focus on user experience and mobile delivery, the Agylia LMS and Apps continues to push boundaries in using social learning, microlearning, gamification and experience API technologies to deliver modern learning experiences. Learning Tribes is an L&D organization with the mission to deliver outstanding training solutions, including with TRIBOO, a MOOC-based LMS that delivers multi-device learning solutions designed to support medium to large organizations with their training needs. TRIBOO is a user-friendly platform with the resources and support that any complex organization needs. To create a modern learning experience for users, PeopleFluent offers a combination of on-demand learning, embedded microlearning, formal instruction, social interactions, mentoring, and video content delivery. Delivering a robust learning solution enables our users to uniquely design their approach to learning. Tortal Training specializes in developing interactive e-learning solutions. We make effective training easier by specializing in engagement. We are the only training partner that uses strategic engagement methodologies for organizations with distributed workforces to maximize training effectiveness in an era when talent development is essential in driving sustainable business results. Intrepid by VitalSource’s learning technologies, Learn and Discover, help global companies and organizations develop people to solve big business challenges such as onboarding, sales enablement, leadership development, and secure content delivery. Our mission is to create learning solutions that empower an organization’s learners, reflect their brand, and create a culture of continuous learning in their organization. We become an extension of our clients’ team to help solve business challenges and create engaging, results-driven learning solutions that resonate with their learners. Xyleme is the LCMS of choice for visionaries who understand that learning content is a business asset. These thought leaders are looking for innovative ways to change how learning is created and delivered. Our platform is for companies that have complex content challenges, helping them to create, publish and deliver learning content efficiently. MOS Chorus LMS/LCMS enables the creation of multiple portals for the extended enterprise. Known as the “Swiss Knife” LMS (agile) and “Haute Couture” portals (full customization of learners’ environment). The Smart Learning Portals ease the initiation/deployment with ready-made learning environments for a specific business sector/target audience. LearnUpon LMS helps organizations to train their employees, partners and customers. With unmatched ease of use and unrivaled customer support, businesses can manage, track and achieve their diverse learning goals—all through a single, powerful solution. SkyPrep has the mission to simplify online training and knowledge sharing so that organizations can reach their full potential. Our award-winning products serve over 500,000 users from leading companies in different industries and sectors around the world. Every day we strive to be the most innovative software company in the market. MATRIX is a product of CYPHER LEARNING, a company that specializes in providing e-learning platforms for organizations around the world. The platform is known for its easy-to-use and beautiful user interface, comprehensive set of innovative features, and pricing that provides great value for money. Skilljar is the leading customer training platform for companies to accelerate product adoption and increase customer retention. Skilljar’s enterprise-grade platform is purpose-built for external training and provides all the essential tools for training and enablement teams to successfully onboard, engage and retain customers and partners. At Unboxed, we create training and technology that’s not only different, it makes a difference. Our clients achieve results like a 15-60 percent increase in YOY sales and a 40 percent increase in employee productivity using our employee training and sales enablement solutions. If you’re tired of boring training and clunky technology, it’s time to Think Outside™. D2L views our relationship with customers as a true partnership, from our flexible, modern, robust learning platform to our best-in-class services. We work with enterprises and departments to deliver business results. We are constantly working to build the most innovative learning platform for our customers. eXact Learning Solutions is a leading, business solutions provider in the field of digital learning. Its content life cycle includes collaborative content creation, structured and workflow-based content management, and multiple output delivery of content in any desired format on the embedded LMS or any other LMS / Web Portal. Administrate’s learning management system is suitable for any training provider to run e-learning courses for their students. We have customers based all over the world, spanning many different industries. With three offices based in Scotland, Lebanon, and North America, we are well-placed to service customers wherever they are located.